Studies have shown that first impressions last. That’s why it’s important to be sure people’s first impressions of you are good. And if you only have one chance to do it right, it pays to do everything you can to improve your odds. In business, a first impression can decide whether or not you get that new job, or it could help a customer choose whether they’ll buy from you or not. A poor first impression could cost you money or an opportunity, but a good first impression can help you establish relationships with people that can help you reach your goals. Be on Time: It’s so easy, but so many people get it wrong. Being late to an important meeting shows disrespect for the other person’s time, and it makes you seem arrogant and disorganized. Being on time, on the other hand, shows that you’re taking the appointment seriously. It also makes you appear more confident and poised, because you’ve had time to gather your thoughts and review your notes. Do your Research: Before any important meeting, make sure you know a little something about the person you’re speaking with. People naturally connect with those with whom they have something in common, so find out if you’re from the same city or whether you’ve traveled to the same landmark. Those shared experiences can be great icebreakers. When meeting with a company, prepare some talking points that are relevant to the business, or think of questions that show you understand their unique challenges in the marketplace. Be Positive: Maintain a great attitude and a positive perspective whenever you’re meeting someone for the first time. A first encounter is not the time to start complaining about your last employer or grumbling about business setbacks. While some of your complaints may be valid, they can give the impression that you’re someone who looks to assign blame rather than taking responsibility for his or her own actions. Say it with a Smile: Some studies indicate that 90% of what we communicate comes not from what we say, but rather, how we say it. Body language is critically important when making a good first impression, so even if you’re feeling tired and stressed, remember that keeping up that friendly smile can help put the other person at ease, even when words fail you. 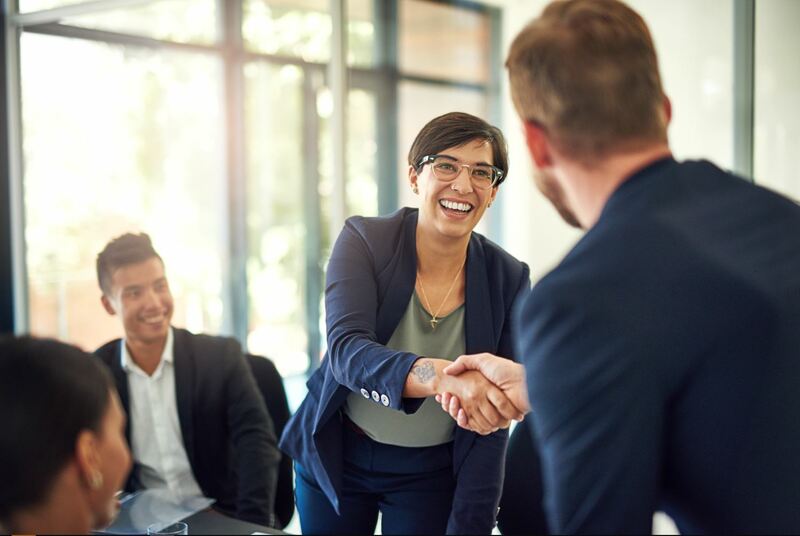 Other simple, non-verbal ways to make a good first impression are maintaining eye contact, nodding in agreement, and giving a nice, firm handshake. Say Less and Listen More: What you say is important, but what might be even more important, is how well you listen. People like to talk, and they enjoy people who pay attention to what they have to say. Show you’re genuinely interested when the other person speaks, and ask follow up questions that show you understand the point they have made. Stay Focused: Eliminate distractions like your cell phone, and plan meetings in quiet spaces where you’re unlikely to be interrupted and where you can hear the other person clearly. Don’t check your watch, and avoid glancing at the clock more than necessary. While staying on schedule is important, obsessively watching the clock gives the impression you’re anxious for the meeting to end. Show Your Manners: When it comes to good first impressions, manners can go a long way. Build rapport by asking the other person about their day or pay them a compliment before diving right into business. Offer to get them a cup of coffee or a cold drink. Thank them for their time and shake hands, or walk them out, when the meeting is over. And, don’t forget to send a nice thank you note or follow up email. Dress to Impress: Putting a little extra effort into your appearance before an important meeting isn’t just about looking attractive. It’s about showing effort. It lets the other person know the meeting is important to you, and it puts you in a mindset to act professional and feel confident. Dressing sharply sets the stage for success, and it helps you play the part. A first impression sets the tone for what’s to come. It can determine the way an employer, business partner, or client thinks about you, and no matter how the relationship evolves, that first meeting will always play a role in how you are perceived. Don’t squander the opportunity. By taking first impressions seriously and following the tips in this checklist, you can be sure you’re putting your best foot forward when it matters most. We are Cydcor, the recognized leader in outsourced sales services located in Agoura Hills, CA. From our humble beginnings as an independent sales company to garnering a reputation as the global leader in outsourced sales, Cydcor takes pride in having exceptional sales professionals and providing our clients with proven sales and marketing strategies that get results.